It turns out that making top quality games for a decade and a half will get you noticed. BioWare founders Ray Muzyka and Greg Zeschuk - collectively known as "The Doctors" - are to be inducted into the Academy of Interactive Arts & Sciences Hall of Fame at the DICE conference in February. It will be the first time that AIAS has inducted multiple people into the Hall in the same year. The pair, along with Augustine Yip, founded BioWare in 1995 after leaving medical school, and have since gone on to create much loved games like Knights of the Old Republic, the Mass Effect series, and Dragon Age. In a statement, AIAS president Martin Raen said that the Doctors embodied what it meant to be Hall of Fame inductee, and the range of their talents - from game design, to leadership and business acumen, and even their original vocation as physicians - was endless. 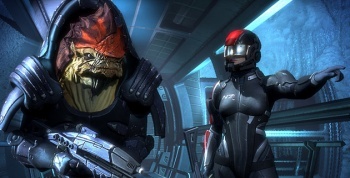 Muzyka said that he and Zeschuk shared the honor with all the members of BioWare, who - along with a shared vision of quality and entrepreneurship - were the secret to BioWare's success. Zeschuk thanked his and Muzyka's respective wives for their support over the years, as well as the families of their employees. He also said that it meant a great deal to him that he could stand beside his business partner and friend as the first people to be inducted into the Hall of Fame simultaneously. Epic Games president Mike Capps will present the Doctors with their award. Previous winners include Nintendo's Shigeru Miyamoto, Maxis founder Will Wright and id's John Carmack.